Family | Wherever you go, there you are. 596 miles before we sleep. From Tennessee to the Canadian border, Interstate 81 lays down most of its 854.9 miles in Virginia, 324.9 to be precise. Paralleling the Appalachian Mountains, I-81 follows along Indian and early settler trails. A pretty ride if you’re in the passenger seat, but if you’re the driver zooming along at five or ten or fifteen miles over the limit, you can’t take your eyes off the road . In Pennsylvania, heavy truck traffic labors up the hills while cars play hopscotch at terrifying speeds. Accidents that tie up traffic for hours are a given, and the drive is bum-numbing for passenger and driver. Until last week, I was always the passenger; now I’m the driver. Peter helped me brake, gasped occasionally, and pointed out interesting sights that I didn’t dare glance at. Frackville, in Pennsylvania’s Wyoming Valley, was our destination, 379 miles from home, an overnight on the way to daughter Carolynn and husband Bill. It’s 596 miles door-to-door. Our stop was planned, but the relentless rain that jammed traffic into bumper-hugs wasn’t on our itinerary. What should have taken five hours, took more than six. Driving is the best way to get there. Air travel doesn’t take long if you pay for a direct flight, but add in the drive to an airport, hours-early check-in, another hour to their home, and car travel proves quicker and cheaper. Then, when we return in a car stuffed with a huge pumpkin, three mums, gallons of fresh cider, jars of home-canned delights, boxes of cookies, as well as shopping finds and our bags, there are no added fees to pay. When we neared Frackville, the GPS insisted on “hard right turns.” Wrong. After two loops on and off I-81, I turned hard left and there we were. Cold rain and wind hurried us inside. The motel was terrific — Holiday Inn Express — and there was a super breakfast bar the next morning. Three more hours on the road and Carolynn, Bill and the dogs were waiting with big smiles, enveloping hugs, and doggy kisses. The week was packed tighter than our car on the return — gourmet meals, cards, dominoes, dog walks, laughter, talking…lots of talking…especially when Carolynn’s friend Robin was around. I’d already decided to drive home with no overnight. It is all downhill. 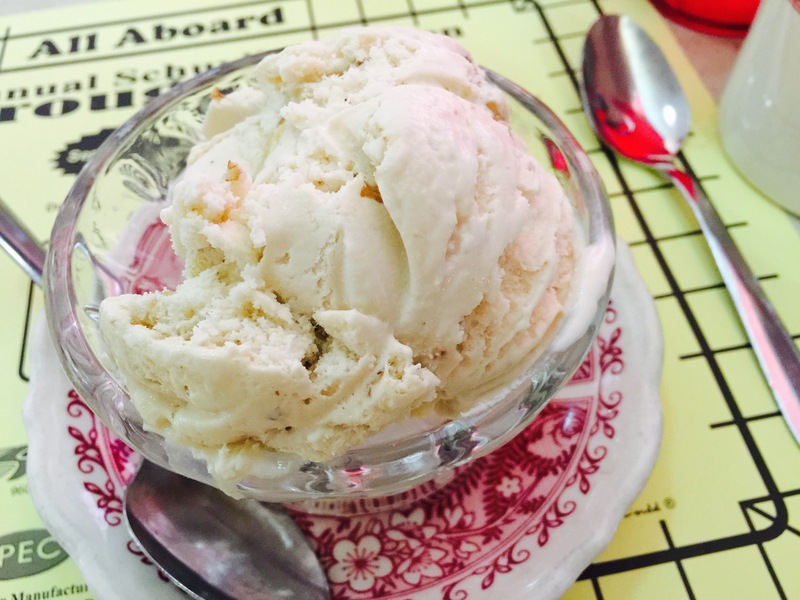 We did stop for lunch at Frackville’s Dutch Pantry, noteworthy for its diner history, and treated ourselves to homemade ice cream. No more non-stop drives in my future, though. Unh uh. I was reeling when we arrived. 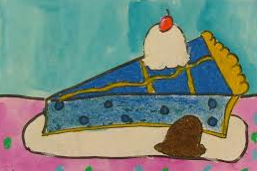 After 596 miles, my pillow called and visions of the week danced through my dreams. Orange begonias and pink phlox. with Duffy close beside her. Anemone corps de ballet takes a final bow. It’s the packaging that encapsulated the two standard-size, 20″ x 30″ pillow cases I bought this week. Don’t ask me why pillow cases, and indeed sheets, blankets and any number of other items need to be zipped up in plastic. True, the ones blankets come in can be re-used to store out of season clothes, for instance, and I’ve used the smaller sizes to keep things sorted when I travel. But really, why can’t we just purchase such things “unwrapped,” so to speak? My mother made sheets and pillowcases from muslin. 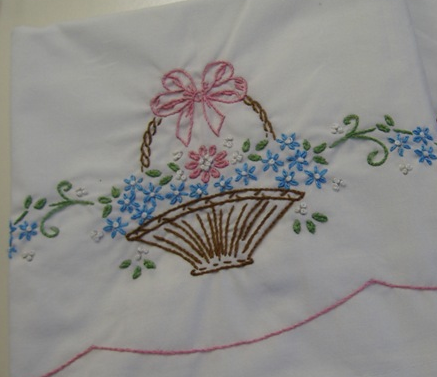 Sometimes she prettified the pillow “sheets,” as she called them, with embroidery. The thought of buying something she could make for “half the price” was scandalous to her. To be truthful, I thought I’d died and gone to heaven the first time I slept on store-bought sheets. There’s a world of difference between unbleached muslin sheets and soft, combed-cotton ones. Five decades ago I remember buying sheet sets that were wrapped only with a pretty satin ribbon tied in a bow. Back then, “off-the-shelf” meant a sales clerk took the items off the shelf behind the counter and showed the items to you gently, almost reverently. Today, sadly, the term means the customer takes it off a shelf herself, handles it, makes her decision, and often, if she decides against the purchase, she shoves it back any ol’ where. Today’s self-serve mentality has redefined both shopping and packaging. 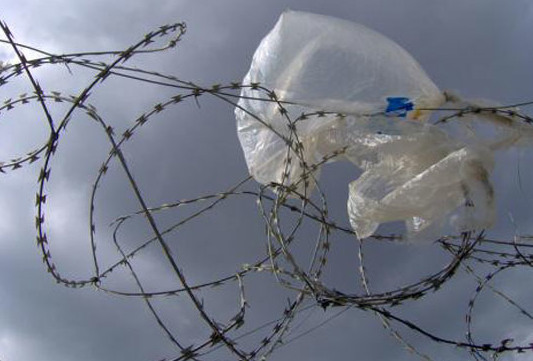 This week, [9/30/14] California became the first state in the nation to outlaw plastic-film bags. Stores will no longer be able to provide disposable bags to shoppers and they must charge for paper bags. The hope is that people will rely on reusable bags instead. Eliminating disposables will reduce the amount of plastic film that winds up in waterways, on roadsides, in trees and landfills. Of course manufacturers are already planning protests, but couldn’t they retool their factories to make reusable totes instead? Of course they could, they just don’t want to. 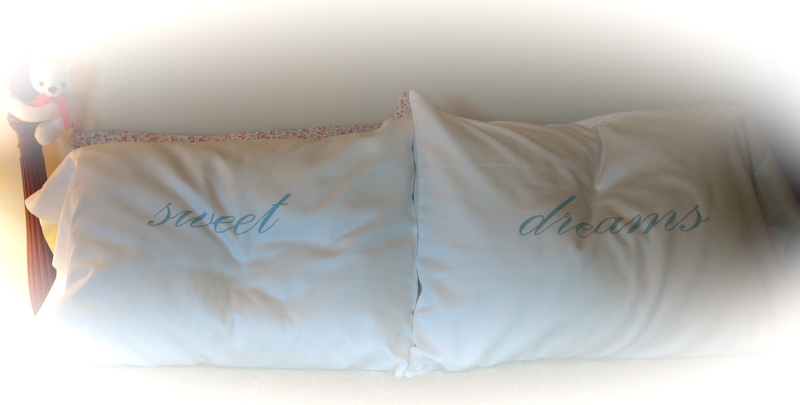 These thoughts were tumbling around in my head the day I found the most perfect pillowcases ever! Smothered though they were in zippered plastic, they promised bedtime solace and no nightmares. Superior pie-baking runs in my family though I didn’t inherit the skills my dad’s cousin had, nor those of my mother, her sister, or their mother. My loyal daughers say they love my pies, and my granddaughter says mine are the world’s best! They’re OK, sometimes they even border on good, but they’re never as good as those made by my female ancestors — Cousin Pauline, Mother Neva, Aunt Dorothy, Grandma Agie. My pies look like rabbits nibble the edges, then hop across the top. The recipe on the Crisco label is my guide, although I add a dash of baking powder to the flour. Dad married another excellent pie-maker after my mother died — the baking powder was Martha’s hint. Last weekend, I decided to make the annual July Fourth blueberry pie to honor what would have been my dad’s 105th birthday. I used my little tin pie pan, halved the pastry recipe, but almost doubled the berries. I made my usual botched mess of the crust. But into the oven it went with foil wrapped lightly around the edges until the final few minutes. I set the timer and headed to my desk. Two hours later, I returned to the kitchen. Why was the oven light on? OMG! MY PIE! Yes, I’d set the timer, but I can’t hear it unless I’m in the kitchen! I expected to see a charred mess when I yanked the door open. It was slightly browner than usual, but not burned. I let it cool, stuck a little American flag in it, and we had it for dessert after our hamburgers/potato salad/corn-on-the-cob feast. Best darned pie I’ve ever made! Martha Stewart would pooh-pooh me, but I think I’ve found the secret to a good pie: stick it in the oven and fuhgeddabodit. xxxx’‘Art by Mrs. Steitz’ web grab. Won’t be long ’til frost. This year his prediction, if he were here to make it, would be even more true than usual. Our long winter, shortened spring, and confused bloom times have made it seem as if it should be autumn already. Local schools closed for summer vacation just yesterday! They’ll reopen August 18, a mere eight weeks away. School buses will be rumbling past our house again before long. Dad would agree with Al Gore (even if he is a Democrat) that we have caused global warming. He knew for certain-sure that sending men to the moon would cause the oceans to rise, hurricanes to increase, tornadoes to rip across the land. Good thing women didn’t go on those moon missions because he’d have had a whole lot more to say about that! Come the winter solstice, he always announced, “Won’t be long until time to cut the grass.” And he was right. No sooner did the snow fall than the mower came out of the garage. Time zipped by faster’n’ a speeding bullet. Nowadays time goes faster still! All my friends of similar age — past “middle” but not yet “elderly” — agree that time has a mind of its own and it ain’t gonna hang around long enough for us to catch up. Recently I’ve been shocked to hear young people say they think time flies too. When I was young, time didn’t even move. This phenomenon must be related to the many ways people “stay connected.” Cell phones weren’t enough, no-o, now we have twitter, tweets, instant infamy on YouTube, and SnapChats. No wonder time zooms! Everyone is so busy communicating there aren’t enough hours leftover to sit on the porch and swing while the days wrap around us like molasses in January, slowly, sweetly.